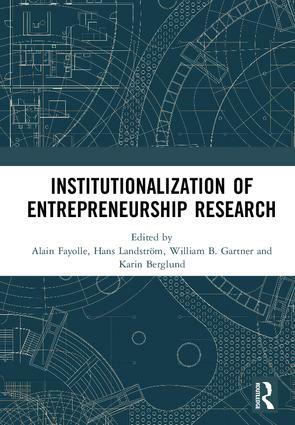 The institutionalization of entrepreneurship is undeniably a good thing for the members of the research community, as it implies the legitimization of particular research topics and research practices; the emergence of norms for developing and publishing this research; and the creation of structures that provide employment opportunities and a conducive environment for pursuing research. However, we can also question if this institutionalization is such a good thing when it comes to producing critical, innovative, contextualized, and complex research or when considered from the point of view of non-academic entrepreneurship stakeholders and society in general. The objective of this bookis to challenge the main research streams, theories, methods, epistemologies, assumptions and beliefs dominating the field of entrepreneurship. In order to achieve this objective, this book comprises six conceptual and empirical contributions, each one unorthodox, controversial, inspiring and challenging. This book was originally published as a special issue of Entrepreneurship and Regional Development. Alain Fayolle is Professor of Entrepreneurship at the Emlyon Business School, Lyon, France. Hans Landström is Professor at the Sten K. Johnson Center for Entrepreneurship at Lund University, Sweden. William B. Gartner is Professor of Entrepreneurship at Babson College, MA, USA. Karin Berglund is Professor of Business at Stockholm Business School at Stockholm University, Sweden.